7.55 Click on the stars to rate this FontStruction. 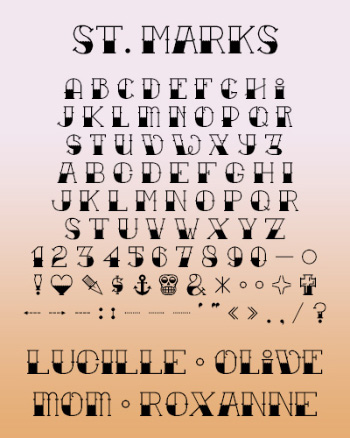 A tattoo display font with art deco-inspired alternates and tattoo flash dingbats. Info: Created on 15th August 2015 . Last edited on 23rd August 2015. Congratulations! FontStruct Staff have deemed your FontStruction worthy of special mention. “St. Marks” is now a Top Pick. Very decorative design. I love the &. Congratulations on the TP. Thanks for the comments and Top Pick! I wish I'd heard of this site years ago.